What would a good student do? Right here. Right now. WHEN I WAS TEACHING CREATIVE THINKING and trying to give my students some incentive, I would often raise the question “What would a good student do? Right here. Right now.” to try to multiply a simple opportunity into a small miracle. Possessing a copy of Genesis 1:1 from the Dove's Bible adds an element of obsession on our part to the Doves type that was used to print it. It occurred to us that it might be interesting to buy Die Kunst Der Typographie and see how Paul Renner would use his own typeface, Futura. I did buy it. You can see that the letterspacing is wide letterspacing is incredibly wide by today's standards. What makes Lead Graffiti so hot? At Lead Graffiti we are extremely fortunate to have invested in the purchase of an Intertype C4 linecaster. It adds significantly to the historical value of our collection as well allowing us to offer a first-hand experience with "hot metal" type for participants in some of our workshops. DO YOU TEACH TYPOGRAPHY? Here is a project you should give twice. The first time during the first week of the semester. The second time during the last week. We hated working for a client who came armed with a logo and an accompanying design manual dictating specific color options for both the logo and the corresponding background, how close images could occur to the logo, etc. I stumble across printed samples and photos of some work that was part of my life back in my Visual Communications days. One of the perks that came from being a designer working for clients and doing a lot of printing work (and I tended to work with only 1 or 2 printers) was that I could leverage those printers into printing VC stuff for free. In the beginning there are 60 sophomores. It was more difficult than they imagined. These sophomores are still with us. the pressure, just to do something else. Those that stay, stay for the same reasons. These juniors are still with us. but the reward becomes greater. a part of their work. These are the seniors that have stayed. One of the things we always say to say to students is that if they are interested in letterpress (or honestly just interested in design), they need to find real projects they can do for real people. This was one of those we could have just as easily not done. After finding our Harrild & Sons Albion iron hand press had been part of Laboratory Press at the Carnegie Institute of Technology back in the 1920s, we recently visited the Hunt Library at Carnegie Mellon University to see some of the things printed back in the day. Porter Garnett who initiated the fine press program at CIT wrote out these 10 commandments printed in a small booklet printed at the New Laboratory Press, College of Fine Arts, Carnegie Institute of Technology. Handset in Hunt Roman, a type designed by Hermann Zapf, Printed 18 June 1963. Thou shalt not seek novelty for its own sake. Thou shalt not employ expedients. Thou shalt not exploit thyself nor suffer thyself to be exploited by others. Thou shalt not concern thyself with the opinions of any but the sensitive and the informed. Thou shalt not give to anyone the thing he wants unless for thyself the thing that he wants is right. Thou shalt not compromise with popular taste or with fashion nor with machinery nor with the desire of gain. Thou shalt not be satisfied — ever. If I was starting teaching now and I knew what I know about this assignment, I would make every student in every class do 3 - 5 of these projects every semester. You get points for each one to encourage students to work toward the maximum possible. Document field trips, speakers, assignments, best solutions, semester portfolios. And I would group them into albums. Then I would give the gazillion pages to some outstanding Special Collections focused on education. Princeton would be a good one because John Nash taught there and the photo at the top is from the results of this assignment done by Ari Garber (VC'05) produced because we watched the movie, about John Nash, as an in-class event. in every instance students work as solitary designers on their pages, though more than one album page may be desired for more important events. depending on how you think the students will organized themselves and the relative importance of particular events, more than one student might produce a particular album page. the instructor should generally figure out how many album pages might be produced during a semester. Say there are 20 students and the general desire is for every student to produce 3 album pages which gives you a total of 60 pages in that class in that semester. Each individual student will produce a final portfolio page. If there are 7 different assignments during the semester and you figure you want the top 3 of each assignment documented, along with 2 field trips with every student going, and there are 5 other important in-class events (movies, guest critiques, etc. ), and there are 5 other events outside-of class you expect students to attend (movies, guest speakers, etc.). 20 portfolio pages + 21 individual class project solutions + 2 field trips + 5 in-class events + 5 outside-of-class events would total a mimimum of 53 (remember you want 60). You need to double up some of those last events to provide enough for the students. And I would add this on top of everything else you are doing, not instead of some things. The students will learn how to plow through these things pretty quickly and the restrictions should reduce the overall effort. NOTE: Students will complain, but you can help them find ways to get a lot of result from little work. The example at the top was given to a good student who was producing the album page for the movie “A Beautiful Mind” that I showed in class. He was complaining about how he just didn’t have time. He was a great student and I wanted to help him understand how a design decision could reduce the time. Writing these pages can take a while if they need to be written well with lots of words. So, let’s just set the DVD in the computer, set the captions to be on, and just screengrab every set of words in the most important scene in the movie. Organize them into a grid and it was pretty much done in a little less than 3 hours. In the end, it would be the best and most thorough journal about teaching that ever existed. Starting day number 1 and going through day number ? The journal itself, closed—a kind of heavy metal design journal. The idea for the project came from Rose DiSanto (VC'83) who was teaching a course for us, replacing another faculty member on sabbatical. It was a project set up with a heap of rules. Individual pages may have specific guidelines or needs. For instance a page about a writing class might need more words, but a page about a photographer might need more images. Click here for an index of some examples (appears to the right) of pages designed by Ray Nichols to see some design issues he thought were important for those events. It is important to remember that pages can be used in three ways. As pages in the mother VC family album where it will be one of probably 200 pages per book and then multiple books that will develop over upcoming years. A page for an event can be used as a thank you. The pages are 17" x 11" but are printed on 19" x 13" sheets. This provides some blank area around the image so that participants in the event can sign the page. The page will then be given to people to be thanked. Hopefully, they will keep it around and be reminded of their interaction with us. A set of pages can be gathered and used as a mini-book with a particular focus. This can also be given as a thank you. A good example is the VC / London trip. We will do individual pages for all of our visits (which will be given to them) along with a set of all of the pages to the Center for International Studies as a document recording the trip. We might also keep a separate book in VC for students to look at without having to deal with the mother-of-all-journals version. One additional point worth making is the importance for subjects for such pages so that we will have an excuse to design them. It is the design experience we are looking for. The rest of it is just helpful to do. You'll need 3 stuffed files (InDesign template and the two dominant typefaces Didot and Avenir) to produce pages using these rules and guidelines. text must incorporate any details which are necessary to placing the page content into the correct context as part of the VC history story (date, their participants / titles, VC participants, place, etc. include a .2 pt horizontal rule always centered (33p below top trim) across the page ( the rule is locked into template). There are instances when you might rather have the rule pass behind an image. 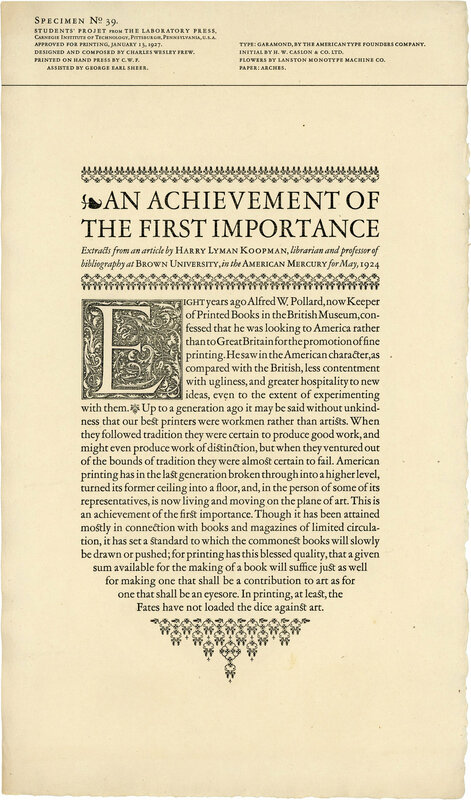 have one headline set in Didot Roman (see image below), 48 point, 100% black and positioned vertically as dictated by the supplied master page using the appropriately supplied stylesheet. The bottom serifs of the type align tangentially with the .2 rule with the typography in front. The headline may be positioned anywhere along the line. incorporate 1 – 3 characters (no more or less) in any font other than Didot Roman in any form. It is important to choose a font that contributes to the design of the page. Additional care should also be taken with sizing and kerning the type. Below is what the type looks like together. The Didot sits exactly on the rule and the Avenir Black explanatory line is in front. print on the front of super A3 size Epson Premium Luster Photo Paper (19" x 13") and trim to 17" x 11"
must show a credit line which begins with "Page design:" and ends with " / DEsigners." There are spaces on both sides of the "/". Following the colon, specific tasks performed by others is to be listed (i.e., Page design: Raymond Nichols; retouching: Hendrik-Jan Francke; copy: Bernie Herman; photography: Bill Deering."